Part of a mind-blowingly large range of tents available from Danish outdoor company Robens, the Mythos Duo is an easily pitched, lightweight touring tent. As tent technology gets more advanced, and tents get lighter and lighter, it's still tricky to find a tent that ticks all the boxes for cycle touring. It has to be light, yes, but you also need sufficient space that if you're sharing you won't end up a little too cosy (unless you want to) and you'll need useable space for bits and pieces, including your panniers and kit for overnight safety or if it's raining. So, a tall order. The Mythos Duo is designed to be a super lightweight two-man tent, with enough space for decent levels of on-trail comfort and room for some kit. 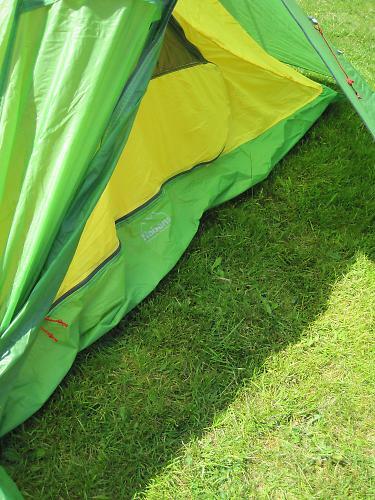 It has a two pole design (although they pitch together, joined with a clever 'swivel hub' in the middle) and can either be pitched fly sheet first or as one piece. The flysheet fabric is lightweight seam sealed, PU coated nylon ripstop with a 2000mm hydrostatic head and is also fire retardant. The floor is a heavier duty ripstop with a 5000mm hydrostatic head. The guylines have a reflective weave in them to make them easier to spot when you're stumbling about in the dark with a headtorch. They tighten using little cleats and they also allow use of a special wrapping system, developed by Robens, to allow the tent to be made even more secure in windy weather conditions. Poles are DAC Green Anodized Featherlite NSL poles ('green' because the process of anodizing them uses significantly less water and no nasty acids as most anodizing processes do) and the flysheet fastens to them with twist clip hooks. 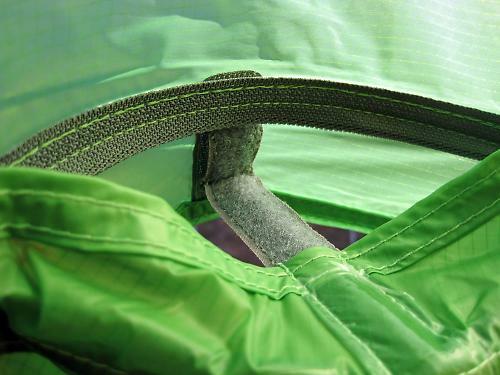 There are a variety of mesh pockets inside the inner tent and a gear line for hanging bits and pieces off, as well as ventilation ports which are accessible by zip either from inside or out, and wedge open, if desired, with a little projecting arm of stiffened fabric. In addition to the main tent sleeping area, there are two separate doors, both with mesh insect door options, and two separate porches. 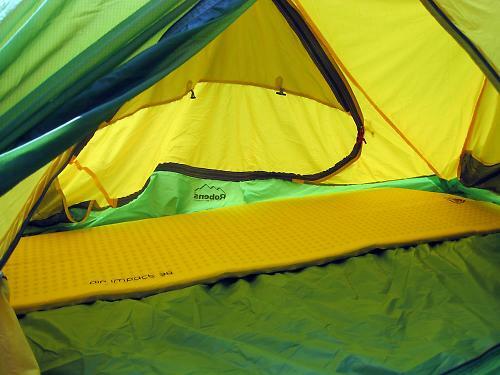 The inner tent living space is rectangular and is 210cm long and 120cm wide. With all those bells and whistles, and a super lightweight, I was hoping that this was going to be a good tent to pack along on tours. It didn't disappoint. The tent, poles and pegs pack down in their own waterproof bag to a package about 40cm long and 20cm diameter, meaning it will fit INSIDE most panniers, let alone strapped to the rack at the back. The shade over 2kg weight (all in) is pretty much the same as most of the lightest weight two-person tents available, and barely more than the vast majority of one-man backpacking tents, so it's a great option for two sharing or even for luxurious solo missions. Putting the tent up was a doddle. Even without the instructions (I believe that a tent should be straightforward enough to pitch without needing complex instructions) it was up and ready to sleep in within 15 minutes max. The guyline cleats make tension adjustment simple, and the twist clips and innovative swivel hub at the top were just brilliant. So easy to use and reassuringly solid, as were the poles. There was sufficient space for two without spooning, although two strapping six-plus footers still might find it cosy. The ventilation ports were a nice touch, providing a good through draft, and easily opened from inside or out. They neatly stopped the worst of the condensation that can build up in a tent during the night. On warmer evenings it was great to be able to open up both doors all the way, with the door flaps tucking away into nifty little pouches. The tent was stable, although it didn't experience any seriously bad wind, but with the Storm Guard guyline tensioning system, I don't doubt it would have been up to the job anyway. The best thing by far about this tent was the two separate porches and doorways, meaning if there are two of you, you each have your own space for kit and coming and going, or you can designate one as a gear storage area and the other as an entrance and bad weather cooking area. Each porch was sufficiently large for a pair of full sized panniers, meaning kit wasn't out in the wet and posing a temptation to passers-by or wildlife. Having said there's space for two, I'd be pretty happy taking this as a one-person cycle camping tent too, given that there's only a couple of hundred grammes in it weight wise. If you're expecting protracted periods of rain, it's nice to have the extra space and it allows plenty of storage too. It's not a tent designed for winter use, but other tents in the range are, if that's your thing. After use, it was very easy to strike camp too, with the tent rolling down to fit in its bag quite easily, unlike many lightweight tents I've used where the tent seems designed to be just a little bigger than the bag it came out of. The poles and pegs fitted easily too. Price wise, this is a very reasonable price for such a high performance, ultra lightweight tent, with most costing upwards of £300 and some up to £500. It'll last years and years if you look after it as well. Not cheap, but a top notch three season two-person tent, light enough for solo excursions and with plenty of storage space. Aimed at any camper wanting an ultra technical super light tent with good features. Top notch fabric, components and construction. Very easy and quick to pitch, plenty of space and lightweight. The floor isn't as heavy duty as in some tents and the super lightweight nature of the fabric does mean more care needs to be taken as time passes, but still should last a decent number of years. A great (and useful) balance between weight, useable space and features. Enough space for two without feeling over claustrophobic. Palatial for one. 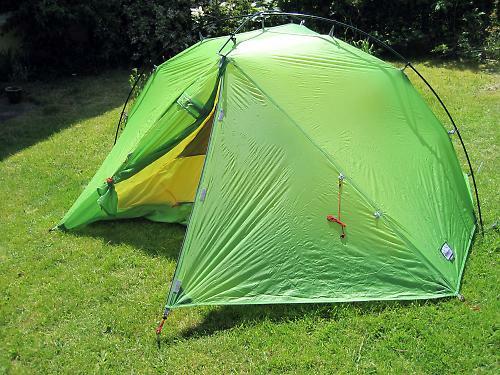 If you're looking for a bargain bike camping tent, this isn't it, but if you're looking for a well designed, fully featured ultra lightweight performance tent, then it's hard to find fault with this price, which is cheaper than most of the equivalents on the market. Slightly less heavy duty floor than I'd have liked, but just for reassurance. Did you enjoy using the product? Yes, a lot. An investment, but worth it for the low weight, well considered space and features.